June 1926 marked the commencement of the first session of the Vassar Summer Institute of Euthenics. The Institute was started by President Henry Noble McCracken as a "…graduate program designed to supplement the undergraduate curriculum along the lines of euthenics." The Summer Institute was an offshoot of the controversial euthenics major, which had been established a year earlier in the Minnie Cumnock Blodgett Hall of Euthenics. The new facility was also the site of the summer program. The inception of both the euthenics major and the Summer Institute generated a lot of contention and opposition from members of the Vassar faculty, who believed the entire concept of euthenics was vague and counter-productive to women's progress. …especially at laying before the college woman who has become, or will become, a home-maker the contributions of the sciences to her particular problems in whatever forms these can be made most beneficial to her, thus enabling her to become a greater asset to her home and community." The Summer Euthenics Institute differed from the undergraduate program in that it was intended for both men and women and was generally aimed at people older than college-age. A particular emphasis in the summer program was on the role of the father in the family unit. The father was expected to be an active and equal participant, not merely the stoic observer. …a growing sense of the importance of their jobs, not only to themselves and their families, but to society as a whole…there was the deep thrill that came from applying scientific methods to the world's most tradition-bound occupation…it was perfectly evident, even when prejudices cropped out, that the students also found it exhilarating and inspiring, and holding the possibility, if anything could, of making housework over from drudgery into an interesting job, able to hold its own with other occupations as a vitally important piece of work, capable of constant improvements with new ways, new efficiencies, and new horizons. This response from the people who actually participated in the Institute and the reaction they caused in others helped to gain it legitimacy and acceptance in the eyes of critics and to ensure its continuance throughout the years. 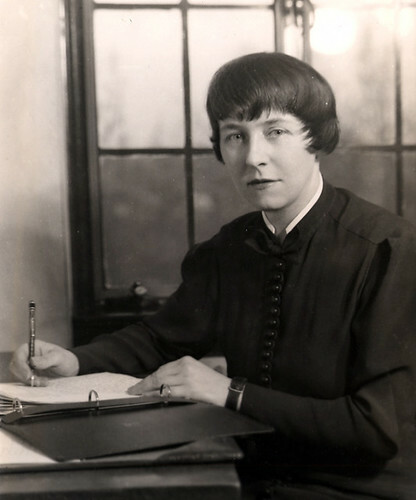 Professor Annie Louise Maclead of the chemistry department served as the first director of the Summer Institute from 1926-1929. Enrollment was open to men and women with at least a high school diploma, and enrollment to the accompanying Children's School was open to children between the ages of 2 and 4 of the adult students. The first Summer Institute enrolled 44 college graduates and 20 children. Most of the women were homemakers, but even in the first year the project attracted some professional women who did not have families of their own. In 1929 Dr. Ruth Wheeler, a professor of physiology and nutrition, took over as director of the Summer Institute, and she would remain in the position until 1942. With 1942 came, most importantly, the arrival of Mary Shattuck Fisher Langmuir, who would serve as the Institute's director until 1957. Langmuir, a nationally recognized expert in the field of child and family psychology and at the time the chairman of the Department of Child Study at Vassar, revolutionized the Institute and propelled it to national fame. Langmuir's first task as director of the Summer Institute was to ensure that there was a Summer Institute. The war economy, since the Institute was operating on a deficit, had nearly lead to its being shut down, but Langmuir, along with a number of supportive members of the faculty, was able to convince the college to keep it open, on the condition that it be able to carry on "without cost to the college." Economies were achieved by instituting cafeteria services in place of served meals, dispensing with tablecloths and linen napkins, abolishing maid services, and increasing the number of applicants accepted to the program without increasing the number of faculty members. Langmuir and her supporters were also able to reduce costs by enlisting juniors and seniors who had completed one or two years of undergraduate work in Child Study, Child Psychology or Education as assistant head teachers in the Children's School. Also in 1942, Langmuir decided to drop the often misunderstood and contentious name "euthenics" from the title, and the Institute became known as the Vassar Summer Institute for Family and Child Care Services in Wartime. During the war years the Institute became, as the 1942 brochure explained, "…a training and demonstration center where parents, teachers, and other professional workers will study together ways of meeting the new problems which the war is bringing to all families and communities." The wartime institutes were sponsored and approved—although not financially supported—by numerous state and federal agencies, such as the Children's Bureau, the U.S. Office of Education, and the Office of Civilian Defense. The government interest in the Summer Institute furthered helped it stay financially afloat, as it dramatically increased the number of students who attended the Institute on scholarships provided by boards of education, the State Department, the U.S. Office of Education, and organizations such as the National Council of Jewish Women, the National Conference of Christians and Jews, and China Aid Council. In a report written in 1949, Langmuir concluded that the "…scholarships not only help balance our budget but help guarantee that we shall have representation of many nations and religions, and all races in our student body. Such representation is always a major goal of our admission policy." Also changing in 1942, admission now became open to men and women with a high school education and "…at least two years of training in a liberal arts college, professional school, or the equivalent in special study or in experience in community work." It was also the first time that recommendations—which could be from a member of a college club, or some other educational, welfare, religious, civic, or service recognized organization—were required for all applicants. Additionally, the age of admitted children to the Children's School was expanded to 2 through 12. Enrollment of adult students doubled during the war years, and enrollment of children also greatly increased. Under Langmuir's direction, the Summer Institute also achieved a balanced budget for the first time in its history, and in the years 1943-45, it required only a $1,000 grant from the Trustees, whereas Institutes of the previous 10 years required a grant of at least ten times that amount. The Summer Institute incorporated seminars, workshops and lectures, the topics of which varied by year. While previous years had offered study in child development, community services, religion, and education, the war institutes were somewhat different, offering courses in leadership training in the fields of child care, community organization, extended school services, and nutrition, as well as more specialized courses such as one entitled "Preparation for Service in China," which was designed for Chinese students currently living in the United States, who expected to return to China to aid in its reconstruction. The Institute's success under Langmuir propelled it to the national stage and attracted the attention of many influential figures in academia and politics. Eleanor Roosevelt, for example, frequently gave talks and occasionally taught courses throughout the 1940s and '50s. 1) Child Guidance – for social workers, public health workers, guidance specialists, and teachers responsible for guidance programs. 2) Child Growth and Development – for parents and teachers. 3) Family and Child Welfare in China – for Chinese students specializing in the fields of nutrition, public health, nursing, child development, psychology, education, social welfare, and administration. 4) Teaching Methods and Materials for the New Curricula – for nursery, kindergarten, and elementary school teachers and administrators. 5) Problems of Inter-Faith and Inter-Cultural Understanding – for ministers, workers in religious education, school administrators, parents and teachers. 6) Community Organization – for directors, board members, and members of social welfare and service organizations, city councils, parent/ teacher associations, and similar groups. 7) Communication: Radio; Public Speaking – open to all. 8) Household Management in a War Economy – open to all. This would serve as the template on which all other Institutes over the next few years would base their curriculum, with minor additions or deletions with the changing times, such as the introduction in 1946 of a course entitled "Clothing and Individual Color and Style." 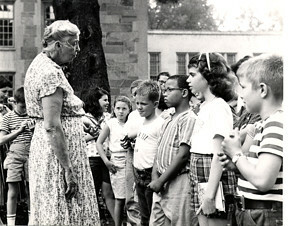 In 1949 the Institute changed its name yet again, this time to the short and simple Vassar Summer Institute, and it shifted its attention more towards homemaking, parenting, and teaching, with courses such as "Homemaking, Income Management, and Personal Appearance," "Nursery Schools, Day Nurseries, and Child Care Programs," "Special Education for the Hard of Hearing Child." In 1950, seminars and workshops were designed specifically "For Parents," "For Teachers and Other Professional Workers," "For Women Whose Children Are Grown," and "A Special Program for Mothers with First Babies Under One Year." 1950 also saw the first time that the Institute offered academic credit for graduate students or professional workers earning a B.S. or A.B. or certification credit for teachers. In 1951 the Institute changed its name yet again, this time back to The Vassar Summer Institute for Family and Community Living. The 1951 Institute offered much of the same courses as the previous two years, but added a few courses on community integration and leadership, as well as courses focused on the latter years of child development. "…adults in process rather than adults who are. For many the resumption of a kind of growth and awareness that had been static since adolescence…"
"…the most 'discussingest' group I ever met!" "…this is where you are dug out of a rut…"
"…pursuing so many worthwhile things in such a relaxed manner…"
Additionally, the booklet included a brief glimpse into the inner-workings of the Children's School, and included the following limerick, written by a group of Summer Institute children about a trip to Bash Bish Falls State Park, in the Berkshires: We once went to place called Bash Bish Where we had an extremely good dish What? More Peanut Butter! I'll trade you one for your fish. In 1957 Mary Langmuir, who had been alternating between her practice and her new husband in England and her work in America for nearly a decade, resigned as director of the Institute. She was replaced by Hans Froelicher, Jr., who once again changed the name, this time back to the Vassar Summer Institute. Froelicher continued the Institute in much of the same fashion, but did not have the same drawing power and charisma as Langmuir, and as a consequence, his Institute was not nearly as successful. In 1958, Froelicher decided to retire, and with no prospective director in sight but with the costs of running the Institute again on the rise, the Vassar trustees voted to suspend operation of the Summer Institute. The fame of the Institute lingered for many years after its official closing, with many colleges and organizations inquiring about the Institute well after it closed its doors. In the reply to one such request, Marion E. Jeudevine, the former Administrative Secretary of the Summer Institute, summed up the legacy and impact of the Institute: "Those of us who were involved in the Institute felt that it performed an unusual service and often brought about lasting changes in family and individual attitudes and lives…we still receive letters of appreciation indicating how valuable the experience has been over the years…." Subject File 17.41-17.42. Vassar College Summer Institute of Euthenics. Vassar College Special Collections (VCSC).